Cells switch fates and acquire new identities during organogenesis and regeneration as a critical trait, although the mechanisms underlying such conversions are poorly understood. 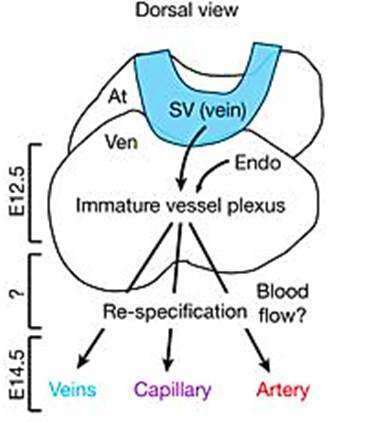 The vasculature provides a biological model to understand this process by differentiating to arteries and veins during embryogenesis, through antagonistic transcriptional programs. The programs include Notch signaling to maintain arteries and COUP-TFs (also known as NR2F2) to maintain veins. During embryogenesis, a portion of the coronary arteries of the heart originate from a vein known as the sinus venosus (SV). Veins can become the source of new arteries during development, although the timing and requirements of vein-to-artery conversion are unknown. 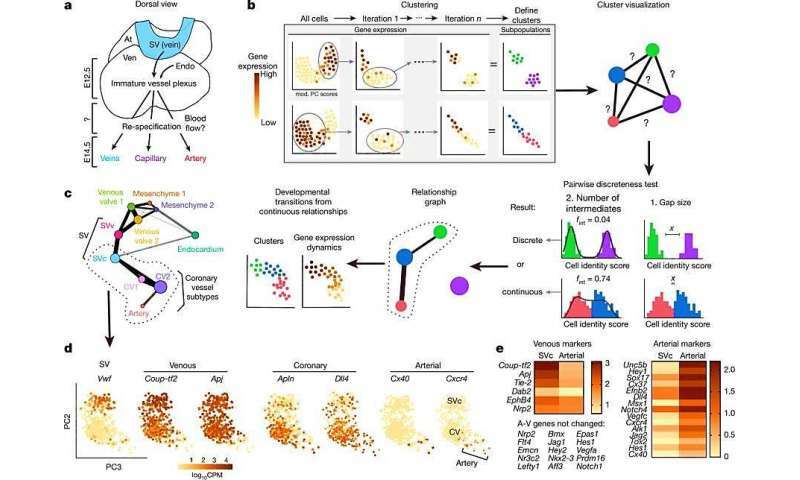 A group of scientists in cardiovascular medicine and bioengineering have recently developed a statistical test to classify cell subpopulations from single-cell RNA sequencing (scRNA-seq) data sets in mouse genetics and identify the cell groups directing developmental transitions during heart formation. 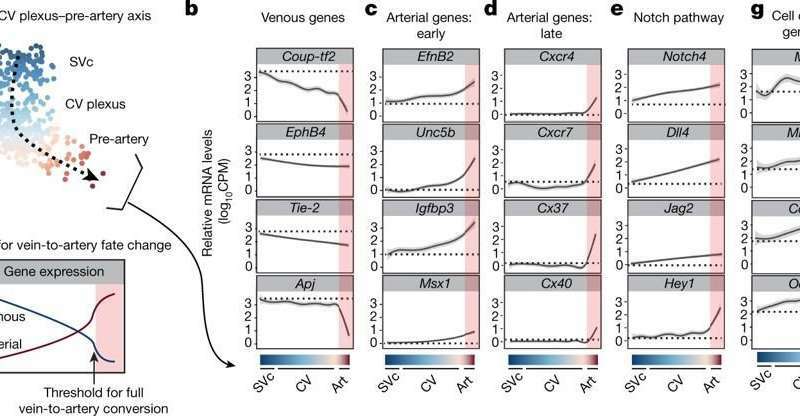 Now published in Nature, the work combined statistical, computational and biological analyses of SV to coronary artery transition, showing that vein cells gradually and simultaneously switched fate from venous to arterial cells, before a subset of cells crossed a transcriptional threshold into the pre-artery state. Understanding how cell fates switch alongside inhibitory signals during development will advance the existing knowledge in tissue growth and organogenesis, for improved tissue engineering strategies in regenerative medicine. In the study, Tianying Su et al. first performed a two-step statistical analysis to identify and cluster the pre-artery endothelial cell subtypes, such as SV coronary progenitors (SVc) and SV valve (SVv) using iterative robust principal component analysis (rPCA), followed by pairwise discreteness tests. Results were confirmed with simulations and presented on a relationship graph to identify developmental transitions of endothelial subtypes in the ApjCreER transgenic mouse line. Cell fate changes were examined in high resolution by observing gene expression changes across continuous populations. Identifying pre-artery cells using scRNA-seq data: a) schematics of coronary artery development, b) computational pipeline: identifying cell fate changes due to gene expression changes across continuous populations, c) relationship graph for ApjCreER-traced endothelial cell subtypes (fint, estimated fraction of cells that are intermediate, x, width of the largest gap in scores between populations) dotted line indicates developmental transition of SV coronary progenitors and coronary vessels (SVc and SVv), d) rPCA plot: pre-artery cells extended from the plexus in the SV coronary progenitor (SVc)-coronary vessel continuum. Gene expression seen in brown, e) heat map of venous and arterial genes. At: atria, endo: endocardium, ven: ventricle. Credit: Nature, doi: 10.1038/s41586-018-0288-7. Scientists then removed lineage-labelled endothelial cells from mouse embryonic hearts at embryonic day 12.5 (E12.5) for additional analyses. Statistical associations were consistent with the anatomical relationships. Notably, embryonic cells showed a switch toward arterial fate before biological blood flow began, and those were called pre-artery cells. Studies with immunostaining also supported embryonic cell maturation and transitions as predicted. 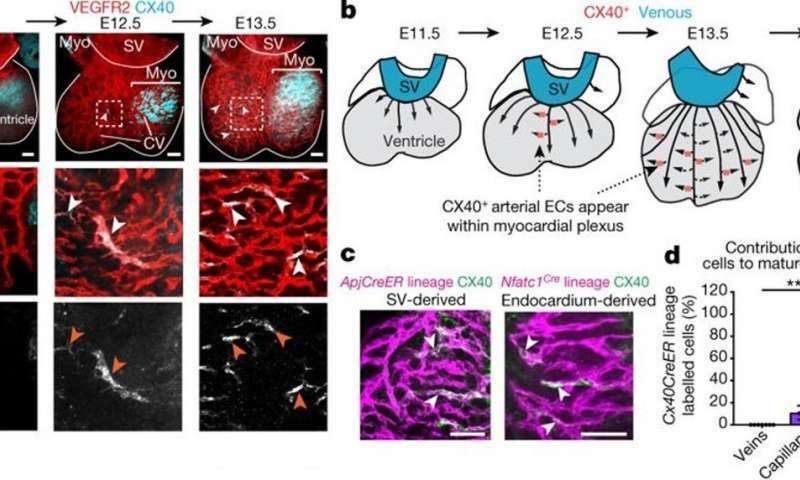 A gap junction protein connexin (CX40), specific to late embryonic stages appeared earlier at E12.5, indicating the role of pre-artery cells as cardiac progenitors building a large portion of mature coronary arteries. Additional structural changes after the initiation of blood flow during heart formation were credited to shear stress. Visualizing pre-artery cells that build coronary arteries via immunofluorescence: a) pre-artery cells positive for cell marker CX40+ appear in blue after immunofluorescent staining, b) schematic of the pre-artery cell transition during coronary development (Embryonic stages 11.5-17.5), c) visualizing CX40+ cells in the SV-derived and endocardium derived networks, d) CX40+ pre-artery cells were observed to compose arteries but not veins. Credit: Nature, doi: 10.1038/s41586-018-0288-7. When the vein-to-artery developmental transition was projected onto a linear continuum, the identity of single venous cells decreased progressively as cells moved toward the pre-artery fate. Findings indicated that the pre-artery specification occurred after reaching a threshold of venous loss and arterial gain; at first, the loss of venous identity was gradual, then arterial identity progressively increased. The venous to artery fate change: a) coronary differentiation pathway (dashed arrow), b-e) gene expression along the differentiation pathway, dotted lines indicate SVc expression levels and red shading on the right hand corner indicate pre-artery cells, f) modeling vein-to-artery fate change based on known marker gene patterns, g) genes involved in the cell cycle decreased in pre-artery cells. Credit: Nature, doi: 10.1038/s41586-018-0288-7. To ascertain that pre-artery specification was necessary for artery formation, the researchers conducted loss-of-function studies in the lab by blocking the process. This was enabled with COUP-TF2 the regulator that typically induces venous fate (while antagonizing arterial fate). 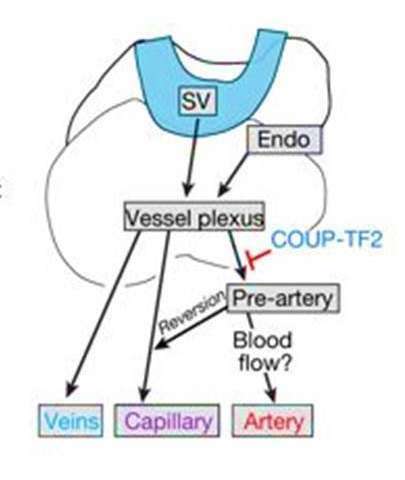 Forced expression of COUP-TF2 before pre-artery specification blocked cells from contributing to coronary arteries – suggesting a failure to acquire the pre-artery fate. Schematic display of the differentiation step blocked by COUP-TF2. The experimental results confirmed its antagonistic potential to prevent pre-artery specification in progenitor cells. Credit: Nature, doi: 10.1038/s41586-018-0288-7. The data showed that fate switching during angiogenesis occurred progressively when individual progenitor cells reached a threshold to differentiate into pre-artery cells that eventually formed mature coronary arteries. Research in basic science can in this way offer insight to understand cellular mechanisms, offering potential therapeutic applications. Future experiments can investigate cardiac artery differentiation during angiogenesis to aid the development of regenerative therapies. More information: Single-cell analysis of early progenitor cells that build coronary arteries, DOI: 10.1038/s41586-018-0288-7 , https://www.nature.com/articles/s41586-018-0288-7 Su et al, Nature, 04 July 2018. Endothelial cells are progenitors of cardiac pericytes and vascular smooth muscle cells www.ncbi.nlm.nih.gov/pubmed/27516371 Chen et al, Nature Communications, August 2016. An object-oriented framework for robust multivariate analysis www.jstatsoft.org/article/view/v032i03 Todorov et al, Journal of Statistical Software, October 2009.